An eyeglass prescription is a pad issued by your eye doctor after an eye exam, specifying all the numbers and signs which may be used for us to process eyeglasses for you. In 1978, the Federal Trade Commission passed a regulation rule known as Ophthalmic Practice Rule or Eyeglass Rule. The rule requires eye doctors (optometrists or ophthalmologists) to give patients their eyeglass prescriptions at no extra cost. Based on the rule, you can ask for a copy of your prescription from your eye doctor after an eye exam. One more thing, please ask your doctor to include PD number (pupil distance) in your prescription. 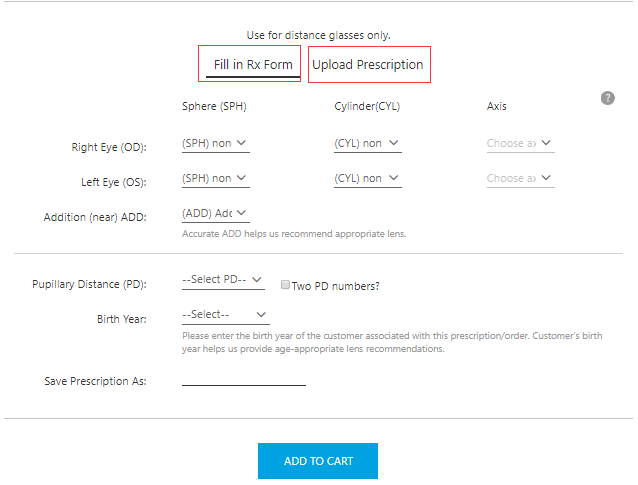 Can I use my contact lens prescription to buy my eyeglasses from you? No. Contacts prescription and eyeglasses prescription are different. The contacts prescription cannot be used to process eyeglasses. You could check with your doctor what your correct eyeglasses prescription is. No. We strongly suggest you use your eyeglass prescription in the most recent 2 years to order with us. Actually, Eye Care Professionals (ECPs) suggest an eye exam every six months or one year to detect any possible eye diseases in the earlier stage. 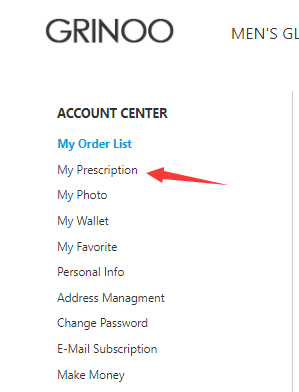 You can add and save your prescription for permanent use in your Grinoo account, to avoid filling it every time for new order. 2. 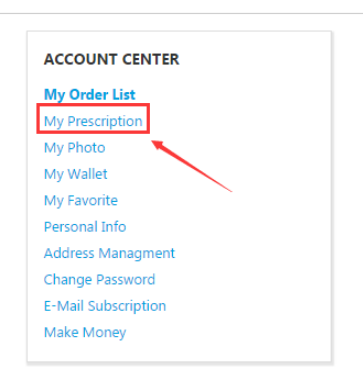 Go to your Account Center and choose " My Prescription"
3. 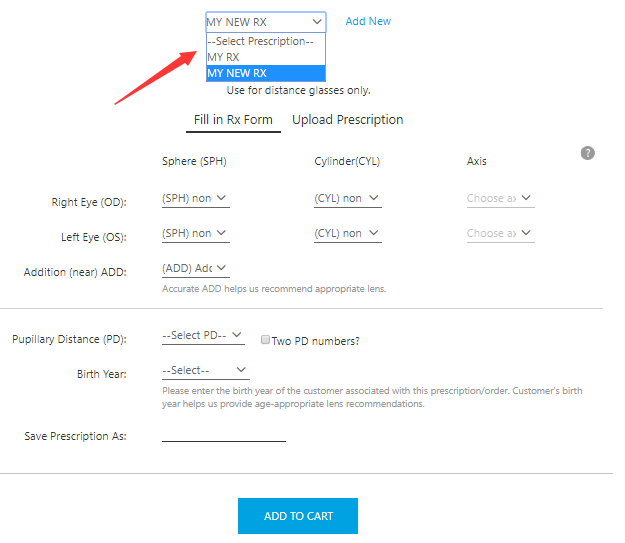 Click on "Add New Prescription"
4. 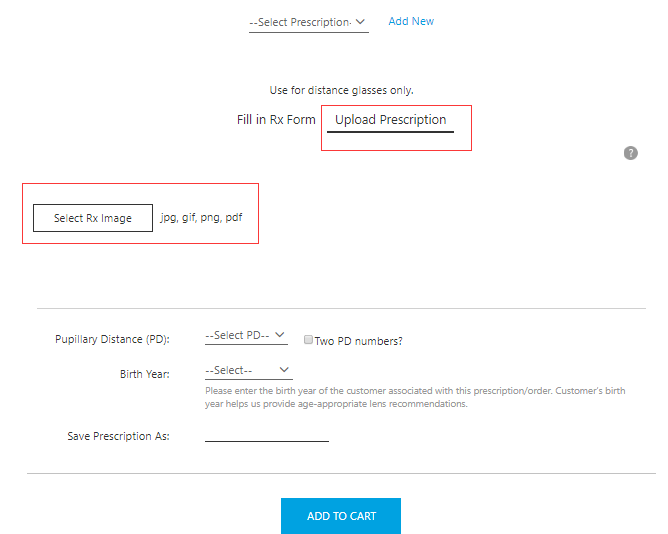 Upload your prescription picture or enter your prescription numbers. 5. 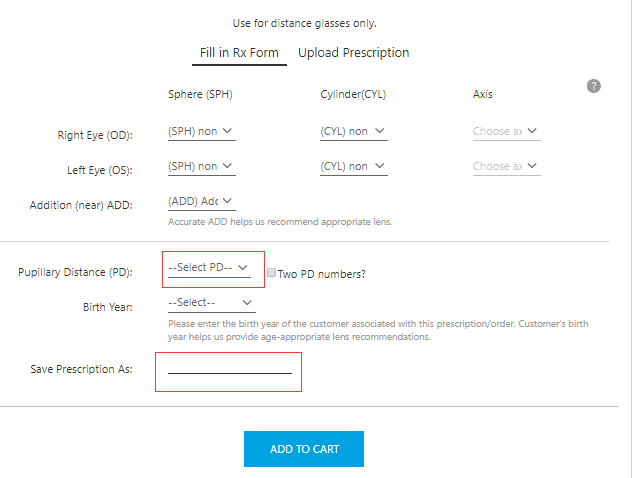 Select your PD, name your prescription and add to cart. 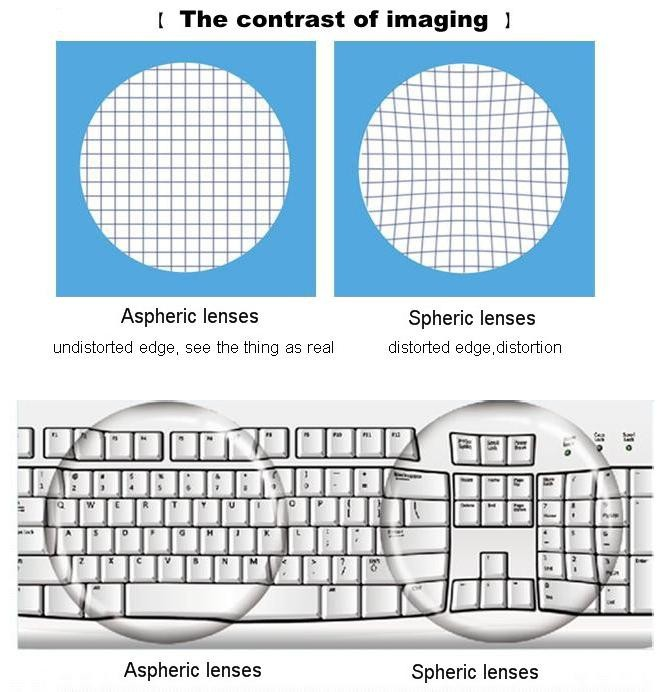 SPH=Sphere=Spherical, indicates the amount of lens power, prescribed to correct nearsightedness or farsightedness. If the number appearing under this heading has a minus sign (–), you are nearsighted; if the number has a plus sign (+) or is not preceded by a plus sign or a minus sign, you are farsighted. The larger the number following the +/-, the stronger the prescription. CYL= Cylinder= Cylindrical, indicates the amount of lens power for astigmatism. This number also has "+" or "-" signs. If "DS" or"SPH" or "spherical" or "PL" is stated at the place of CYL, it means you have no astigmatism. Axis=a number between 0 and 180 degrees, and indicates the orientation of astigmatism, measured in degrees from 1 to 180. If an eyeglass prescription includes cylinder power, it also must include an axis value, which follows the cylinder power. Add, short for Reading Addition, is the additional correction required for reading. It can be used to make either reading glasses, bifocal glasses or multifocal glasses. 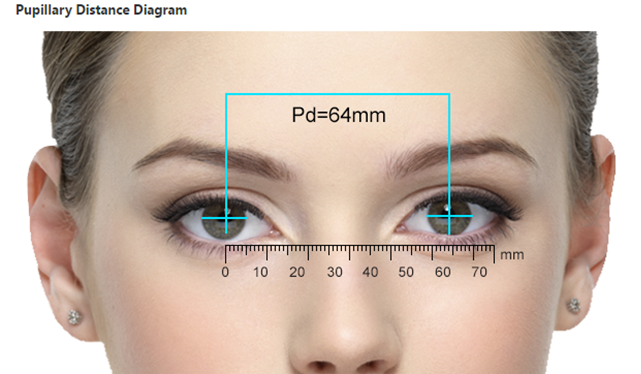 PD= Pupillary Distance, stands for Pupillary Distance, which is the distance between your pupils in millimeters, Your PD is very important for accurately fitting your lenses to achieve vision acuity. Prism: refers to the prismatic power used to correct vision displacement. It helps to correct some special conditions or some eye disorders (like squints) that require the focused image to move position. The measurement is Prism Dioptre. The value may be as high as 10 and may go up in steps of ½ or 1 Prism Dioptre’s. PL: Plano. Latin for "flat." 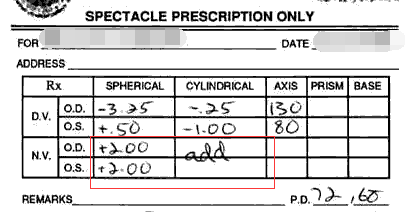 If this is in the SPH section of an Rx, it means no nearsighted or farsighted correction is needed. 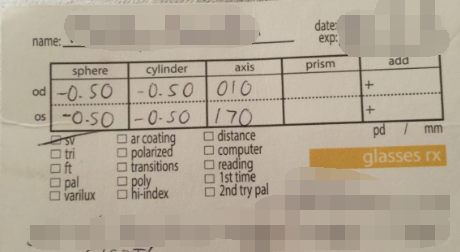 How to fill in the prescription with prism? Upload the original prescription picture at our website directly. We could only make single vision glasses for prescription with prism right now. And you need to pay extra $9 for prism prescription. Can I fill in strong prescription? We offer glasses with SPH from -18 to +10, and CYL -4.50 to +4.50. If your SPH/CYL is beyond this rage, please send your original prescription to service@grinoo.com for checking. With a strong prescription, you are suggested to choose a full frame (better made of acetate material) with narrow and small lens. TABO prescription: both eyes are measured the axis anticlockwise. INT prescription: the right eye axis is measured in anticlockwise and the left one in clockwise. INT prescription is only used by some Italian, Swiss and French ophthalmologists, while the real world standard is TABO. And the Grinoo standard is also TABO. The Axis of INT prescription needs to be transferred before fill in the prescription on our site. To get the prescription in TABO system, the axis for the right eye should be 180 minus 15. So the TABO prescription we get should be the following one. Myopia, or nearsightedness, is the most common refractive error of the eye. If you are nearsighted, you typically will have difficulty in seeing distant objects clearly but will be able to see well for close-up tasks such as reading and computer use. If there is a minus in your SPH, it means you have myopia (nearsightedness). Hyperopia, or farsightedness, is a common vision problem, affecting about a fourth of the population. People with hyperopia need correction focusing on objects that are both up close and far, and often feel eyestrain. The condition is sometimes referred to as "hypermetropia" rather than hyperopia. If there is a plus in your SPH, it means you have hyperopia (farsightedness). Astigmatism is a common vision problem caused by an error in the shape of the cornea. With astigmatism, the lens of the eye or the cornea, which is the front surface of the eye, has an irregular curve. This can change the way light passes, or refracts, to your retina. This causes blurry, fuzzy, or distorted vision. The Add, short for Reading Addition, is the additional correction required for reading. It can be used to make either reading glasses, bifocal glasses or multifocal glasses. The 'addition' is only required if the glasses are going to be used for reading or close work. If your glasses are for distance only, this will not be an issue. Please kindly note that if you have ADD and choose distance glasses, the glasses can only be used for seeing far, not available for reading. Sometimes opticians use the word 'Add' or 'Near' instead of 'addition'. They may only write it once, but it normally applies to both eyes and is almost always the same value for both eyes (e.g. 'Add' +2.50 - should be entered for both eyes). SPH (Sphere) indicates the amount of lens power, prescribed to correct nearsightedness or farsightedness. If the number appearing under this heading has a minus sign (–), you are nearsighted; if the number has a plus sign (+) or is not preceded by a plus sign or a minus sign, you are farsighted. The larger the number following the +/-, the stronger the prescription. CYL (Cylinder) indicates the amount of lens power for astigmatism. This number also has "+" or "-" signs. If "DS" or"SPH" or "spherical" or "PL" is stated at the place of CYL, it means you have no astigmatism. The axis indicates the orientation of astigmatism, measured in degrees from 1 to 180. If an eyeglass prescription includes cylinder power, it also must include an axis value, which follows the cylinder power. "OD" and OS" are abbreviations for oculus dexter and oculus sinister, which are Latin terms for the right eye and the left eye. Some doctors and clinics have opted to modernize their prescriptions and use RE (right eye) and LE (left eye) instead of OD and OS. On your eyeglasses prescription, the information for your right eye (OD) comes before the information for your left eye (OS). Prism refers to the prismatic power used to correct vision displacement. It helps to correct some special conditions or some eye disorders (like squints) that require the focused image to move position. The measurement is Prism Dioptre. The value may be as high as 10 and may go up in steps of ½ or 1 Prism Dioptre’s. Prism powers will always be accompanied with a direction which is usually seen as a base direction such as IN, OUT, UP and DOWN; for example; Prism 2.00 Base IN. Some people may have a prism in two directions for one eye, for example; Prism 2.00 Base IN & 1.00 Base UP. We can only make single vision glasses for prism prescription. 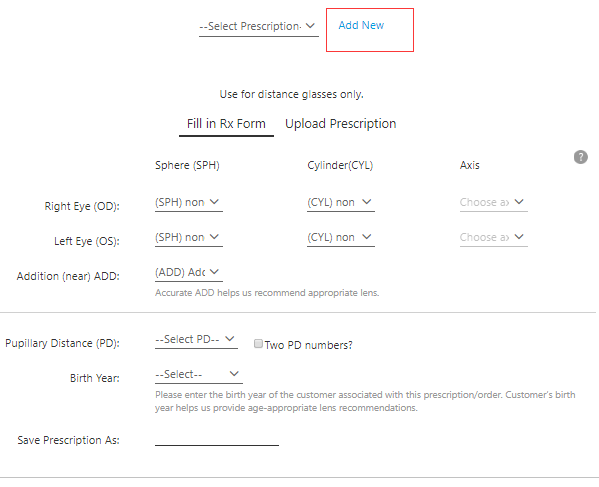 If you have prism, please upload your original prescription picture when you order. The light transmittance of new glasses is higher. So you may feel brighter compared to old ones. It usually takes several days to get used to new glasses. Some customers may feel the prescription is strong and a bit painful in the eyes.Usually, it takes about one week to adapt to a new prescription. If it’s still not working, you could ask your eye doctor to adjust your prescription or try to order a new glasses with your old prescription. The change of frame shape may cause discomfort. Such as changing from square to round, small to big. For a big frame, the lens will be thicker. Some customers may feel dizzy and usually takes one week to adapt. If you still feel dizzy, you could change to the previous frame shape. 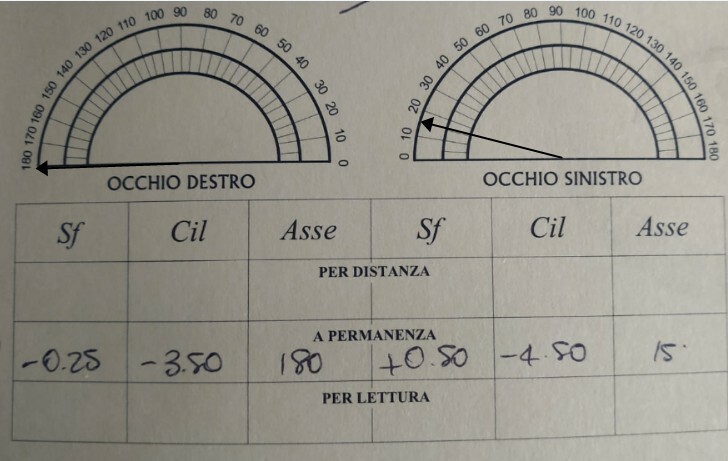 Discomfort caused by discordance of prescription and lens index. If you have a strong prescription and choose low index lens, the lens will be thick and the blind zone will be larger, which leads to more distortion in vision. For low prescription, choosing a high index lens will reduce the light transmittance and increase chromatic aberration, which leads to the decrease of visual clarity. Discomfort caused by the spherical lens. Generally speaking, the spherical lens is thick and the image through the lens will be distorted. 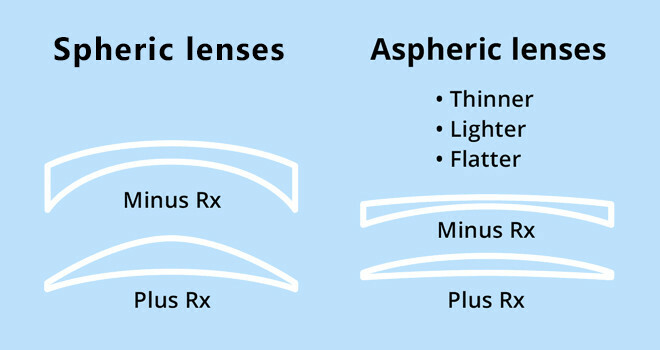 While, with the same prescription and index, the aspherical lens is thinner, lighter and more comfortable for wearers. The aspherical lens has a wide vision and the image through the lens is more real and natural. Wearers will not feel tired after wearing aspherical lens for a long time. If you don’t choose anti-reflective coating, you may feel the lens are too reflective and with too much glare. So don’t forget to choose the coating when ordering. Discomfort caused by adjustable nose pads. The position and direction of adjustable nose pads will affect the distance between your eyes and the lenses. For the near-sighted, if the distance is too small, you may feel the prescription is strong and pain in the eyes. You could try to adjust the nose pads by forcing them stay closer and inwards to each other, which will enlarge the distance. On the other hand, if the distance is too large, you may feel the prescription is weak and blurry. Try to adjust the two nose pads and make them stay further and outwards to each other, which will shorten the distance. For the far-sighted, please try the opposite way. Accurate prescription doesn't always mean comfortable glasses. To process a pair of glasses, besides the accuracy, we still need to think about the balance of your two eyes’ diopters, and the comfort, etc. But sometimes you will get a prescription that only attempts to show your eyes condition without considering if you want to use it to get a pair of glasses. So if you find you are having a headache or dizzy wearing the glasses with right prescription and proper frame, you may need to ask your doctor to adjust your prescription for eyeglasses.